Casa Newport adds the finishing touches to outdoor living with their premium skimmer lids. The premium skimmer lid is the answer to the common "eyesore" white lid that rests next to beautiful pools across the world. 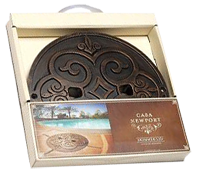 Contact your Export Manager to learn more about these designer skimmer lids by Casa Newport.